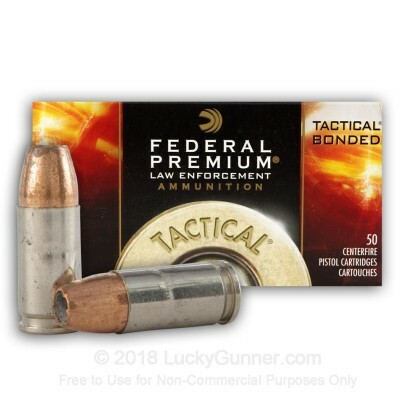 Federal's Tactical Bonded ammunition built for law enforcement use is designed to deliver deep penetration with strong expansion! The bullets loaded into this line of ammunition bond the lead core to the copper jacket. The bonding process is designed to ensure that regardless of the barrier that this bullet penetrates, the lead core and copper jacket will not separate from each other. During impact, when a lead core separates from its jacket, the result is that there is no longer enough mass to achieve sufficient penetration to reach vitals. This Tactical Bonded line of ammunition is a great fit for law enforcement with its deep penetration. 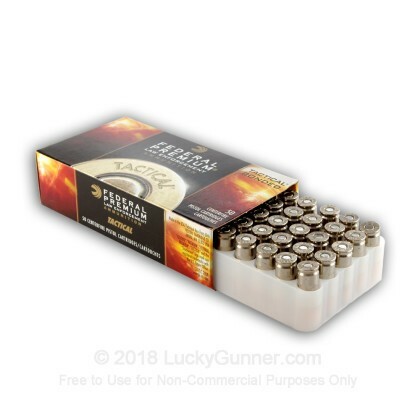 This ammunition is new production, non-corrosive, in boxer primed, reloadable, nickel-plated brass cases. This is top of the line, American-made range ammo - it doesn't get any better than this for personal protection. Designed for Law Enforcement and occasionally made available to the general public through police trade-ins. I see that the loading is 20 fps below the lowest +p rounds out there. I expanded one into water jugs with 4 layers denim at 10' and it measured out at 5/8". It appears one would get decent penetration barrier or none. I usually train at 5 yards then 7 yards double tapping from a draw. Then at 10 and 15 with good aimed shots. I bought a few boxes of this stuff to try out with my Glock 26 Gen4. I had absolutely no malfunctions, and was very impressed with the round. Although it is not designated anywhere this is +p ammo, so im a little confused on that. Regaurdless this is a great stuff and reasonably priced in 50 round boxes! Q: Has LE9T1 been discontinued? Or are they just in a production slump? A: Thank you for reaching out to us at Lucky Gunner! Your question will help us serve you and others who are fond of the LE9T1. We have confirmed with Federal that it was, in fact, discontinued in order to focus on their HST loads. 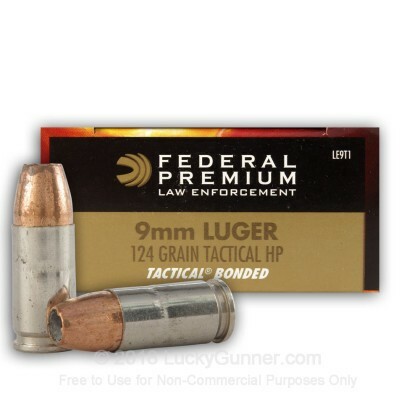 Their 124 grain offerings are all capable rounds that deliver impressive results: 124 Grain HST JHP https://www.luckygunner.com/9mm-124-grain-jhp-hst-federal-premium-20-rounds#geltest +P 124 Grain HST JHP https://www.luckygunner.com/9mm-p-124-grain-hst-hp-federal-premium-law-enforcement-50-rounds#geltest 124 Grain Hydra-Shok JHP https://www.luckygunner.com/9mm-124-gr-jhp-hydra-shok-federal-20-rounds#geltest Their 150 grain load is optimized for sub 4-inch barrels: https://www.luckygunner.com/9mm-150-grain-hst-jhp-federal-premium-20-rounds#geltest So, unfortunately, while the load you're looking for is discontinued, Federal has many contenders bellying up to the bar to take it's place as your preferred duty ammo. Q: What is the difference between. Federal hst tactical vs federal hst tactical bonded??? A: The main difference, as mentioned in the name, will be the Bonded vs. a non Bonded bullet. The Bonding simply references the manufacturing process regarding how the jacket is connected to the core of the bullet. This basically boils down to the chemistry between the two metals and the process the bullet undergoes to apply the jacket to the core. This bonded plating claims to decrease the rate of bullet expansion which will reduce the odds of bullet fragmentation upon impact of the target. This attempts to control the expansion of the bullet. However, a non bonded bullet should not be dismissed as a poor, inferior, or ineffective bullet compared to the Bonded variation. Bonded or not Bonded, you should expect the same high quality and performance you always do from the Federal HST brand of personal protection ammunition.